What Do I Do If My Dog Ate Gum!? Does your dog eat almost anything in sight? Well, that’s what dogs do, anyway! But, the thing is that sometimes, human food isn’t really good for dogs, so I totally understand your panic. And it’s always a good idea to confirm if your dog can or can’t eat something humans do before you feed him. So, today we’ll talk about what should you do if your dog ate gum and if you need to panic or not. The first thing I’d like to address is if your dog can even eat gum. Well, the fact of the matter is that gum is in no way good for your furry bundle of joy. That being said, gum comes in two variants; sugared and sugar-free gum. The thing here to note is that is relatively less harmful for your doggy than sugar-free gum. In the case of sugared gum, your major concern is basically regarding the same thing that you worry about when you’ve swallowed some gum. Well, the thing is that it takes a long time for it to get out of your doggy’s system. Also, it can do some damage to your friend’s insides if it’s left unchecked. What I’m trying to say is that even if this isn’t very good, it’s really nothing compared to those harmful effects of your friend eating the sugar-free kind of gum. Well, in the last section I talked about how sugar-free gum is more harmful for your dog than the sugared kind. In this section, I’ll go into more detail about the sugar-free gum. I’ll start with this first: If your dog swallowed down some of that sugar-free kind of gum, then you need to act as soon as you can. The thing is that most of the sugar-free gums happens to contain a compound named xylitol, which is basically an artificial sweetener. So, what’s this Xylitol all about? Well, Xylitol a naturally occurring sugar alcohol. Also, some traces of it can be found in all types of foods, like corn, oats, berries, etc. The thing is that Xylitol isn’t really harmful for dogs when it is present in it’s natural state. This means that there is no harm if your doggy likes to have those occasional berries as a treat now and then. So, the Xylitol in our chewing gums and other stuff that we use, like candies, breath mints, mouthwash, toothpaste, etc. is actually extracted from places like hardwood trees and corn fiber to use as a substitute for natural sugar. So, what’s this got to do with your doggy friend? The thing is that it takes only a little amount of xylitol to do some of the nasty tricks. In fact, only about 50 milligrams/pound of body weight dosage can result in hypoglycemia in your dog. This means that is you’ve got a really a small doggy friend or one of those toy breeds, then an only a tiny amount Trident can wreak havoc. So, what does Xylitol do? Well, Xylitol toxicity can cause hypoglycemia, or low blood sugar, which will make your doggy friend less alert and a little sluggish. Apart from that, dogs also tend to experience really low potassium levels thanks to Xylitol. Vomiting and loose or “off” coordination of limbs, is also a symptom. But, the worst of all of the symptoms are seizures and collapse. If your doggy happens to have had a large quantity of xylitol, he may even start developing liver failure! What you need to look out for in this case are signs that’ll indicate hypoglycemia. That being said, remember that the amount of xylitol required for such an awful reaction will totally depend on the breed of your doggy and it’s size. Note that the symptoms start occurring within fifteen minutes of having xylitol. This means that you don’t have time to waste and you need to act fast. Help! My Dog Ate Sugar-Free Gum! Now, if your dog has eaten some gum with xylitol in it then you need to act fast! I’d like to start by saying that you needn’t go into a panic if your dog ate gum with xylitol in it if you’ve caught him early enough. The good news is that prognosis is good if this toxicity is handled early. Make sure that you get into the car and take your doggy to the vet as soon as you can before your pup’s liver starts to fail. This is because if you are late and if your doggy has liver failure or any internal bleeding, it may slip into a coma. This means that the prognosis may not be good later. So, rush to the vet. 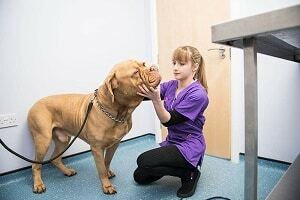 You need to trust your vet completely as he’s the only person who can take the best care of your dog during this time. Your dog’s blood sugar levels will be monitored closely and will be adjusted accordingly to keep them normal. Since this is a really tricky situation, the vet may skip the diagnosis part and jump straight to the treatment part in this critical situation. The treatment will be as fast and as aggressive as possible to keep your doggy friend safe and sound. The main aim of this fast and aggressive course of action is to prevent drastic symptoms from happening due to hypoglycemia. The first thing that your vet may try to do would be to induce vomiting, so as to get the gum out of your doggy’s system. The goal of this is that your dog doesn’t absorb a lot of xylitol. But, what about the antidote? Well, the problem is that there isn’t an antidote developed for xylitol. So, it is probable that your vet may hospitalize your doggy friend. He may even give your friend some IV fluids, liver protectants, and may even perform blood work. Ultimately, the gum will pass naturally and there won’t be any need to worry more about xylitol toxicity. As you can see, your dog having some of that sugar-free gum can turn into an awful thing. So, it is really important for you to try and make your house a safer place for your doggy friend and try to eliminate the possibility of your dog even having gum! Ready for some gum-proofing? Well, let’s begin! So, you know that chocolate is toxic your dog, and I’m sure you don’t keep it laying around the house. You need to be more cautious with the sugar-free gum laying around in the house. Well, the thing is that xylitol is about 100 times (yes, one hundred!) toxic than chocolate is. So, hide that gum, y’all. Let’s assume that you’ve got a tiny furry munchkin, like a 10 pound Maltese. Well, with him, about half- bar of chocolate may prove to be possibly fatal. Now, compare that to your favourite cinnamon Trident and you’ll find that it’ll only take three pieces of it to do the exact same damage to your pup. You must be wondering exactly what I am getting at here by talking about chocolates and bubble gum. Well, I’m trying to tell you that you shouldn’t take this lightly. This instead needs to be a cause for panic. We all know about chocolate’s toxic nature for doggies and it’s been engraved into our minds that we keep chocolate far away from our pup’s reach unconsciously. When it comes to gum, we slack. Maybe because of lack of knowledge. Now, do the math, when only three pieces of gum can prove deadly, we should be extra cautious with keeping gum around the house before anything dangerous can happen. Now, as common sense suggests, you need to keep your guilty pleasure pack of gums in lock up! Okay, you don’t need to be THAT cautious, but you should for sure try to nip the problem right in the bud, stop the awfulness before it even happens. Make sure that you don;t leave any gum in places that your doggy can access with its mouth. Another thing to note is that it’s not just cats that are curious by nature. If your doggy finds you having a piece of gum, he’d want to join in, too! Apart from that, I even suggest that you keep a check in all the products in your house that happen to contain xylitol, like cough syrup, mouthwash, etc. Make sure that you keep such items as far from your doggy friend’s reach as possible. In fact, you can keep a separate locked cabinet for all those things that contain xylitol in them just to be sure no accidents take place. So, let’s take a quick recap, shall we? Well, first and foremost, you need to realize that gum is not good for your doggy friend at all, because they stay in your dog’s system for, what seems like forever, and may do some damage while inside. ● Sugar-free gums contain xylitol which is toxic for your dog and can cause many problems like hypoglycemia, low blood sugar and even liver failure! ● Prevention is better than the cure here, so make sure that you keep sugar-free gums away from your dog! I hope that I was able to help you with your question today. Always know that in such events preventions are better than cure. If you’ve got any comments or concerns, please do share them with me down in the comments section and I’ll reply as soon as I can!